I love order, but I don't see much of it where I live! Hence, I try to impose order on whatever areas of life I feel I have some sort of control over, and this includes quilting. 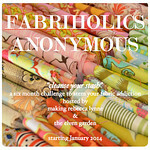 At the start of the year I made a list of what I wanted to sew and when. However this got thrown out the window when I decided I wanted to make a quilt for the Pantone Radiant Orchid Challenge. Everything else got put on hold while I worked and worked on that! But this week order was resumed and I got back to my list. First up was a simple baby blanket for a lovely Indonesian friend of mine who had a little boy last week. I pieced together simple, ordered strips for the front and the back, alternating owls, plain navy and plain lime green. I added a layer of batting, and sewed it all together around the edges. Ideally I would have just used flannel or fleece on the back but I can't get that here. I embroidered a little label to go on the back to make it a bit more special. Head on over there and see all the other entries for this month! Love how you made such a special label! It a brilliant blanket and perfect label!! Love that label too and the color combo is also pretty! I love this owl fabric, very cheery and such a great contrast with the navy,. A lovely baby pressie. Lovely quilt, the colours are so fresh. Neat label too. You certainly went about this quilt in an orderly manner. Green and navy look great together! and the embroidered label is such a special touch. Nice and bright and a great embroidered label too. Love that little quilt! 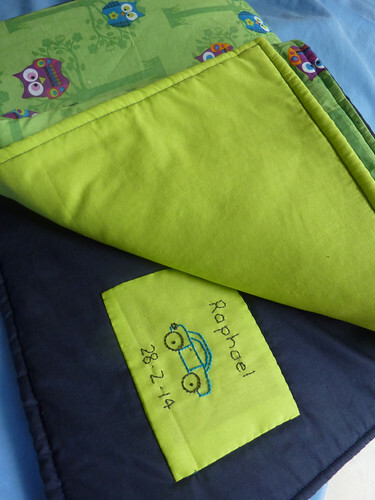 And baby MiH second name is Raphael so I have to love that little label! thanks for sharing on le challenge! Oh what a cute little label! Little touches like that make quilts very special. Oh I love your label! Nice strong colours in the quilt too. Making a quilt for a new baby is quite a treat. i love the lime with the navy! and the label is darling. =) nice work, Deborah.